7 picks from Mexico's top mixologists. Fifty Mils, the highly praised cocktail bar inside Four Seasons Mexico City, is churning out the champions. Head mixologist Mica Rousseau won national mixology competition World Class Mexico 2016 and bartender Fatima León recently took first place at this year’s contest. She will be competing for the title of World Class Global Bartender of the Year this August in Mexico City. Rousseau, who was born in France, helped launch Fifty Mils in 2013 after three years of planning. His respect and passion for traditional cocktails and penchant for creativity result in old school classics with a twist, like the Inside Manhattan, made with bourbon, vermouth, and Angostura bitters and served inside a hollow ice sphere. He manages a team of six bartenders, including León. Born in Mexico City, León previously ran the bar at acclaimed Delirio and Casa Virginia. In 2014 she moved to Berlin to learn more about cocktail creation, returning to Mexico in 2015 and starting behind the bar at Fifty Mils in 2016. Rousseau and León both appreciate a well-earned night off (or a post-work nightcap). Here are some of their favorite spots to grab a drink in the city. This hidden spot from the Parisians behind Le Baron is a “magical place with good music,” says León. It has a mystical, woodsy interior and most importantly, “their cocktails with mezcal and whisky are the best,” says León, like the Negroni Guerrero with mezcal and their take on an Old Fashioned, made with bourbon, amaretto, agave, and Angostura bitters. A “warm and cozy bar” from the owners of La Licorería Limantour, which launched Mexico City’s modern cocktail scene in 2011, Baltra is named after an island in the Galapogos. León’s favorite cocktail there is Some Birds Prefer Flowers, made with St. Germain, Fernet Branca, and simple syrup. This new cantina, originally from Monterrey up north, has a make-your-own gin and tonic, and “everything here is tailor-made, prepared at the moment, at your own table,” says Rousseau. The Fall in Love drink at this clandestine cocktail lounge inside a mansion contains Ketel One vodka infused with vanilla, berries, pineapple, and chocolate bitters and is served in a glass hidden in a paper bag, in a nod to Prohibition. 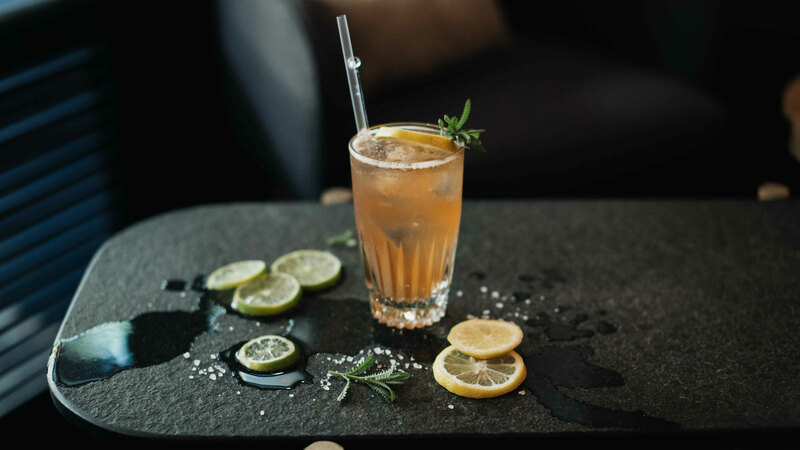 “I love this drink because it fits perfectly with the bar that’s inspired by Marlene Dietrich, located in an old house with antique decoration and an open roof with an incredible view to the sky,” says Rosseau. “Is it okay to recommend my own bar?” asks Rousseau coyly. We say yes, if only because Fifty Mils, with its leafy courtyard, velvet couches, and innovative, handcrafted cocktails represents everything that is right with Mexico City’s cocktail culture today. The Frijolito, Rousseau’s current favorite, is “the essence of the new cocktail menu, sustainability, and culture,” he says. It’s made by cooking beans in bourbon, then straining them out and adding tequila, bitters, and tonic water.